Wild Heaven Height of Civilization, the brewery’s barrel aged Civilization Barleywine returns to the wild this week. 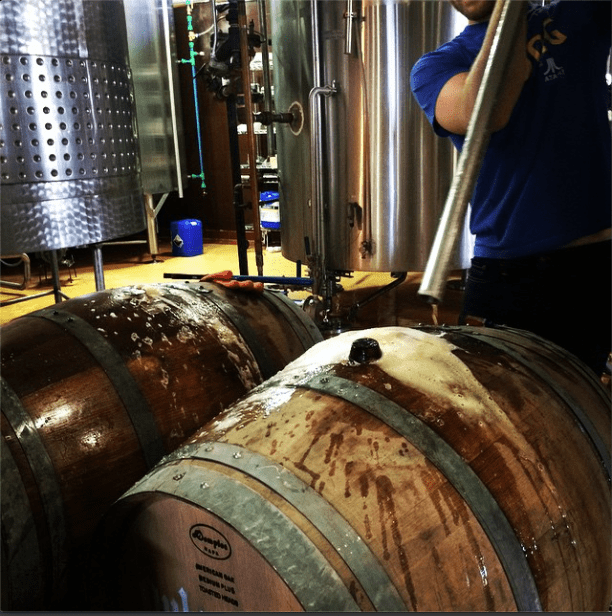 In 2014, the brewery purchased Dulce Vida Organic Tequila barrels ahead of this release. Wild Heaven Height of Civilization spent four months aging in the barrels prior to bottling. The base beer, Wild Heaven Civilization Barleywine, brewed with dried Prussian lemons, Iranian hibiscus, tart cherries, cranberries, and cocoa nibs that have been re-hydrated in Four Roses bourbon. The beer has been so well received, Wild Heaven got a hold of more Dulce Vida tequila barrels to bring this complex beer back once again. Wild Heaven Height of Civilization is available in 750ml bottles for a limited time. Three Taverns Sour Asylum 2 is back in action for the season, and for the first time – cans. This sour is basically Thanksgiving dinner in your mouth. The Decatur, Georgia based brewery kicked off the Sour Asylum Series with Sour Asylum 1, a Lactobacillus kettle soured beer fermented with the brewery’s house lager yeast. The second edition took that beer a step further with the addition of cranberry juice, cinnamon and clove. A perfect Thanksgiving sour beer. They call it “Cranberry Sauced” for a reason. At this point, Three Taverns is at capacity. This is preventing them from putting another release into full production right now. With what little time they have to spare, the brewery is launching a taproom only series of can releases. Cranberry Sauced is the second in our new series of lacto-fermented sour ales. Spiced with cranberry juice, cinnamon, and clove in the fermenter, and balanced by a pleasing acidity from the lactobacillus strain added to the kettle, this unique beer is your perfect companion to the Thanksgiving season. Three Taverns Sour Asylum 2 is on tap the brewery starting today, September 1st. You’ll find it on tap in market in October. Boulevard Cranberry Orange Radler is now hitting shelves. In 2014, the brewery debuted Ginger Lemon Radler. A departure from the brewery’s exemplary lineup? Sure. A success? You bet. Lighter alcohol offerings are always in demand. Now in October, Boulevard Cranberry Orange Radler is expanding the brewery’s radler lineup. Jeremy Danner, brewer at Boulevard mentions that the process to create this release is pretty much the same – base beer is Unfiltered Wheat; swapping in ginger and lemon juice. Cranberry Orange Radler will open with an aroma of sweet blood oranges and just a hint of cranberry. The blood orange character boldly manifests in the flavor giving way to cranberry tartness. Boulevard Cranberry Orange Radler is a 12 ounce can and draft offering in fall, 2016. Terrapin Cranberry Pumpkinfest is coming to cans this fall. A spin on the brewery’s annual pumpkin release. Cranberry Pumpkinfest is brewed with traditional pumpkin pie spices and contains real cranberry juice for just the right amount of tartness. We add pumpkin to the mash for yet another layer of flavor for a beer that is reminiscent of the upcoming season. Terrapin Cranberry Pumpkinfest will be a draft and 12 ounce can offering. The brewery has not yet announced this release. Devils Backbone Cran-Gose is the newest can in the brewery’s lineup. Brewed with hundreds of pounds of pureed cranberry, Devils Backbone Cran-Gose is a tart cranberry ale that finishes at 4% alcohol by volume. Devils Backbone Cran-Gose is a 12 ounce can offering, part of the brewery’s 2016 Daypack Series.